The bursa is an enclosed sac found between two tissue layers, and it provides a cushion as these two layers move about each other. The human body contains more than 140 bursae, all of which develop postnatally. It has been hypothesized that this development is a response to body movement. Bursitis is the inflammation of the bursa, and has a minimum annual incidence rate in Europe of 10 cases for every 100,000 persons. More than 80% of these cases are male, aged 18 – 88 but the majority of which are between the ages of 40 and 60 years. Bursitis can be septic or nonseptic, and chronic or acute in terms of timing. Septic bursitis occurs when bacteria enters the bursa and causes an infection, which leads to inflammation and possible pain. For nonseptic bursitis, inflammation is not due to an infection but instead arises from the trauma that causes bleeding into the bursa or a release of inflammatory agents and also recognisable pain. The elbow joint is a unique hinge joint that allows for the up-and-down as well as in-and-out movement of the lower arms. This range of motion, and the forces that act on the joint, makes the elbow susceptible to injury. Olecranon bursitis is a common cause of elbow swelling and pain. 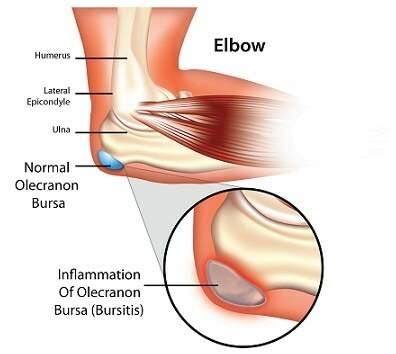 The olecranon bursa is located near the surface, behind the point of the elbow, so it is also the most common site for bursitis in general, and septic olecranon bursitis since bacteria can enter from skin injuries. Two-thirds of cases are nonseptic, and hence are due to trauma or repetitive micro damages. It is sometimes referred to as the “dart thrower’s elbow” as dart throwers are susceptible to this overuse injury due to repetitive bending of the elbow. It may also be referred to as “student’s elbow”, “baker’s elbow”, “swellbow” or “water in the elbow.” Athletes that take part in ice hockey, volleyball and wrestling are particularly vulnerable to nonseptic olecranon bursitis. 90-100% of patients with septic bursitis presents this symptom, while about 45% of patients with nonseptic bursitis has mild bursal tenderness. This is exclusively found in cases of septic bursitis, but roughly only 50% of septic bursitis cases present with a fever. Other than swelling, these symptoms are mainly seen in septic bursitis cases. In nonseptic cases, usually patient has a relatively painless swelling over the elbow and no adverse effect to their health. It should, however be kept in mind that the symptoms of the septic and nonseptic cases can overlap, making it difficult to differentiate between the two conditions. Repetitive stress applied to the elbow area, for example from playing darts. Medical health conditions that impair the immune system (for septic bursitis). For example, cancer, diabetes and renal failure. Similar to other cases of bursitis, diagnosis of olecranon bursitis is usually clinical, with a physical examination of the site by a health professional, and a thorough history is important and may reveal activities that the causes overuse injuries. If septic bursitis is suspected, fluid from the site of infection, which would look like pus, can be obtained by aspiration and used for laboratory testing for Gram stain and culture. A septic bursitis diagnosis may still be made if the Gram stain is negative but other clinical and laboratory features indicate that bursitis is septic. Magnetic Resonance Imaging (MRI) is usually not necessary to make a diagnosis, and hence is rarely utilized, but can be helpful in making a differential diagnosis and eliminating other possible pathologies. Prompt antibiotic treatment should be prescribed if the patient presents with an inflamed olecranon as well as a positive Gram’s stain. Since Staphylococcus aureus is usually the cause of infection, the medication of choice is often penicillinase-resistant penicillin that is administered orally. Those patients that are allergic to penicillin may be prescribed another drug categorized as a first-generation cephalosporin, which are broad spectrum beta lactam antibiotics, but their efficacy is unknown. Erythromycin can also be given for these patients with penicillin allergies, although it is not as effective as penicillin. Intravenous vancomycin hydrochloride may also be administered in the hospital for these patients. There is little information on the effective treatment of nonseptic olecranon bursitis, and it has a significantly higher complication rate than septic bursitis. Corticosteroid injections, while effective in speeding up recovery, has been noted to have a higher rate of complications. Surgery also has a higher complication rate for both septic and nonseptic cases. It is therefore recommended that conservative treatment should be used for nonseptic bursitis such as aspiration, compression, and non-steroidal anti-inflammatory drugs (NSAIDs). Reilly, D., and Kamineni, S. (2016) Olecranon bursitis, J Shoulder Elbow Surg 25, 158-167. Emad, Y., Ragab, Y., El-Shaarawy, N., and Rasker, J. J. (2014) Olecranon bursitis as initial presentation of gout in asymptomatic normouricemic patients, The Egyptian Rheumatologist 36, 47-50. Baumbach, S. F., Lobo, C. M., Badyine, I., Mutschler, W., and Kanz, K. G. (2014) Prepatellar and olecranon bursitis: literature review and development of a treatment algorithm, Arch Orthop Trauma Surg 134, 359-370. McAfee, J. H., and Smith, D. L. (1988) Olecranon and prepatellar bursitis. Diagnosis and treatment, West J Med 149, 607-610. Sayegh, E. T., and Strauch, R. J. (2014) Treatment of olecranon bursitis: a systematic review, Arch Orthop Trauma Surg 134, 1517-1536.